CAD-Earth is designed to easily import/export images, objects and terrain meshes between Google Earth™ and major CAD programs. 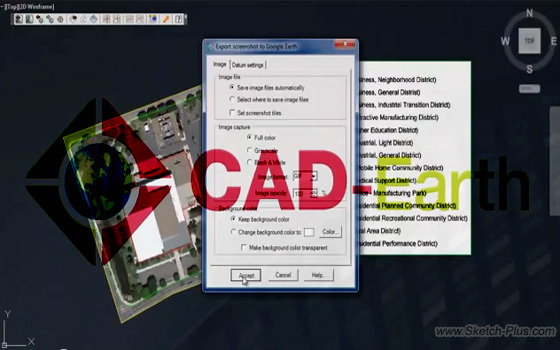 With CAD-Earth you can import and export images and objects to Google Earth™. Additionally, you can import terrain configurations from Google Earth™, draw contour lines, and create cross sections or profiles. CAD-Earth Plus also allows you to perform slope zone analysis, along with many other additional features. What does CAD-Earth look like? This entry was posted in CAD Training and tagged CAD-Earth, CAD-Earth Program. Bookmark the permalink.